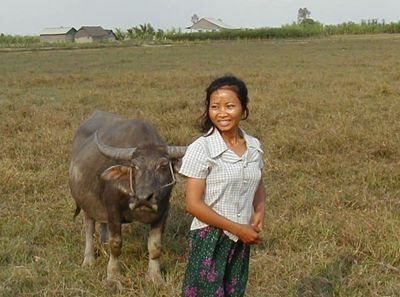 One of the first patients in CHC’s Home Community Treatment Model program, this young woman was cured of her TB and able to work and raise her family. When we first began to treat tuberculosis in the refugee camps at the Thai-Cambodia border, and later in rural Cambodia, we demonstrated that even in an active war zone, or a post-genocide society, people anywhere could take charge of their own health, if they were given the education, support and medicines they need. That insight gave rise to the GHC model. By training community health workers, delivering home treatment, enlisting patient supporters, and providing food, free medicines and economic opportunities, we have successfully treated thousands with TB and/or AIDS. We have done whatever it takes to accomplish this, realizing early on that failure was simply not an option. At the same time, we launched basic research projects, with the aim of advancing knowledge about TB, HIV and their interaction with the human immune system. In partnership with labs at Harvard Medical School and the Immune Disease Institute in Boston, Massachusetts, we are involved in the discovery that is critical to identifying new treatments necessary to stem to epidemic. Our success in Cambodia, and lately in Ethiopia has broken the stereotypes and overcome the biases that existed in the international community. We have shown and continue to show that the poorest people on the planet can successfully follow complicated regimens of TB and AIDS drugs to be cured of TB and to lead healthy lives with AIDS. Armed with knowledge and proper health care, they gladly participate in research that will benefit others like them around the world. All people want to be well and the GHC has proven that, if given the proper support, anyone can achieve that goal.